Anyone who knows me can tell you that I am a huge fan of the History Channel program “The Curse of Oak Island.” I guess it should not be that surprising, as I have always been fascinated by a good mystery. 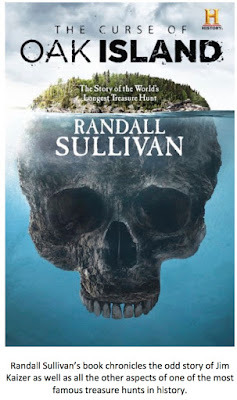 The story of the men and women who have tried to solve the riddle of this small island in the north Atlantic over the last 200 years has captivated me and the program is appointment television at my house. My wife, knowing I wanted to know more about the place, what went on there, and who might have been behind it, gifted me with the book, The Curse of Oak Island: The Story of the World’s Longest Treasure Hunt by Randall Sullivan this past Christmas. I was not very far into the book before I ran across a story I wanted to share. I have gone back and forth over whether or not the tale belongs on this site. Ultimately, I decided it was my site and I could put whatever I wanted on it, lol. In all seriousness, I believe most of you reading this are like me in that you enjoy tales of the mysterious and creepy. This story certainly falls into those categories. 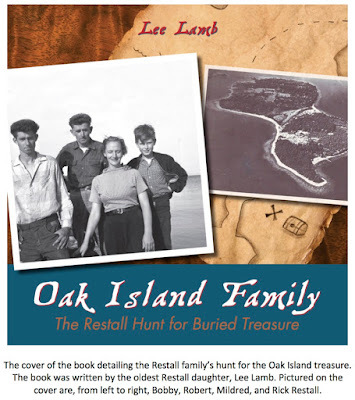 The stories of buried treasure on Oak Island go back hundreds of years, but the story I want to tell you really does not have anything to do with the actual search for riches; rather, it has to do with one of the unfortunate souls whose time on Oak Island looking for that mythical fortune ruined, and ultimately cost him, his life. This is the story of a man named Jim Kaizer. We will pick up the story in 1959, the year Robert Restall signed a one-year agreement with Mel Chappell to take over the hunt for the treasure allegedly buried on Oak Island. Viewers of the television show know the story of the tragedy that befell the Restall family a few short years later well. For the rest of you, I will summarize it now. On August 17, 1965, Robert Restall, at approximately 2:45 p.m., fell into the deep shaft he and his family had been excavating near Smith’s Cove in an attempt to reach the famed “Money Pit,” where untold riches were rumored to be hidden. No one actually witnessed the fall. It is thought Restall was either climbing down into the shaft or leaning over and peering into it when the accident took place. Restall must have made some kind of sound when he fell as his oldest son, Robert Restall Jr. (Bobby), and co-workers Cyril Hiltz and Andy DeMont realized something was wrong immediately and raced to the shaft. Bobby, seeing his father floating in the dark water at the bottom of the pit, immediately started down the ladder to attempt a rescue. By the time Hiltz, DeMont, and Restall investor Karl Graeser arrived and peered into the shaft, Bobby had, also, somehow become unconscious and fallen to the bottom. 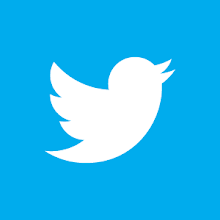 The three men, knowing only that their friends were in dire trouble, starting down the ladder to render aide. Not one of them made it to the bottom before they, too, fell unconscious from the ladder to the bottom of the pit. Present on the island that day was a Buffalo, New York fire captain named Edward White. White had been camping nearby and heard the cries for help. Looking down the shaft, he saw the grisly pile of unconscious bodies stacked liked firewood at the bottom. White realized the shaft must have filled with some kind of poisonous gas that had overcome the men. Even knowing this, he lashed a rope around his thighs and waist and had tourists who had gathered near the opening lower him into the shaft. White managed to get a line tied around DeMont just before being overcome by the gas himself. The tourists on hand lifted White and DeMont out of the pit where they were revived. Robert Restall, Robert Restall Jr., Karl Graeser, and Cyril Hiltz would all die in the cold black water at the bottom of the shaft. News of the tragedy quickly spread until it reached the ears of Jim Kaizer. Kaizer had been working on Oak Island with the Restalls for months and had become very close to Robert. Fifty-one years after the tragedy, Faron Kaizer, Jim’s son, told author Randall Sullivan, “He (Jim) and Mr. Restall were two peas in a pod, both tough and hardworking. They were the type of men who didn’t have a lot of education, but just knew how to do things. Dad really enjoyed going over there. He rarely missed a day, because it was exciting for him.” As fate would have it, though, Jim Kaizer was absent on that fateful day in August of 1965. A water pump at the family home had broken and Jim, at the insistence of his wife, had stayed home from work to get it running. That broken pump probably saved his life. 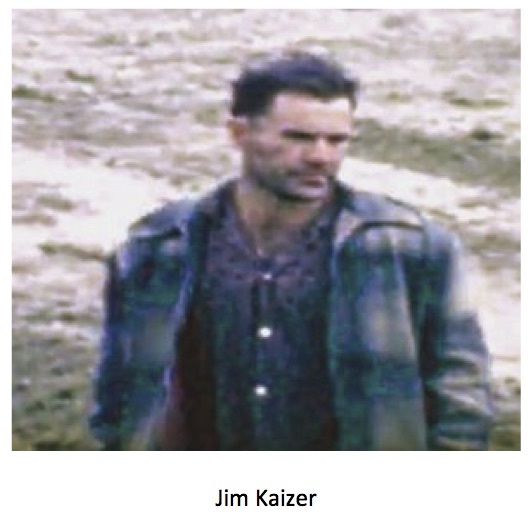 The story of Oak Island treasure hunter Jim Kaizer would end tragically in 1976 when he shot himself in the head with a rifle outside of a bar in Western Shore. He was not yet fifty years-old. It remains unclear as to what tormented Jim Kaizer the most. Was it the death of his good friend Robert Restall and the three other men that terrible August day in 1965? The four hellish, yet heroic, trips he made into the shaft to retrieve the bodies of his friends? The guilt he must have suffered for not having been on site that day? Or was it the hair-covered abomination that pinned him to his cot, stared through him with blood red eyes, and warned him to never come back to Oak Island? Some have suggested a sasquatch/wood ape is responsible for the strange experience of Jim Kaizer, though these people have a difficult time explaining the fact that the creature reportedly spoke. 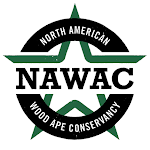 Even most of those willing to accept the possibility that wood apes exist would find the idea of an English speaking individual preposterous; however, such claims, though exceedingly rare, have been made before. The dire warning issued by the creature and the way it disappeared bear striking similarities to the experience of Davy Crockett – who was on his way to San Antonio - in the Piney Woods of east Texas in 1836. He, too, claimed an experience with a huge, hair-covered beast that issued a warning. In a letter to his brother-in-law, Crockett wrote, “…I swear to you, Abe, that what spirit came upon me was the shape and shade of a large ape man…” He added that the creature was, “covered in wild hair.” Crockett then wrote, “The monster then addressed a warning to me. Abner, it told me to return from Texas, to flee this Fort and to abandon this lost cause.” The parallels between these two encounters are eerie and could not be more obvious, but the answer to the question of what was actually seen by these two men remains elusive. Nova Scotia is not without alleged sasquatch sightings and activity. Hikers walking the trails of Uniake Museum Park have reported having had rocks thrown at them, tree-shaking, noises like foot-stomps, and being run out of/escorted from the area by an unseen creature. 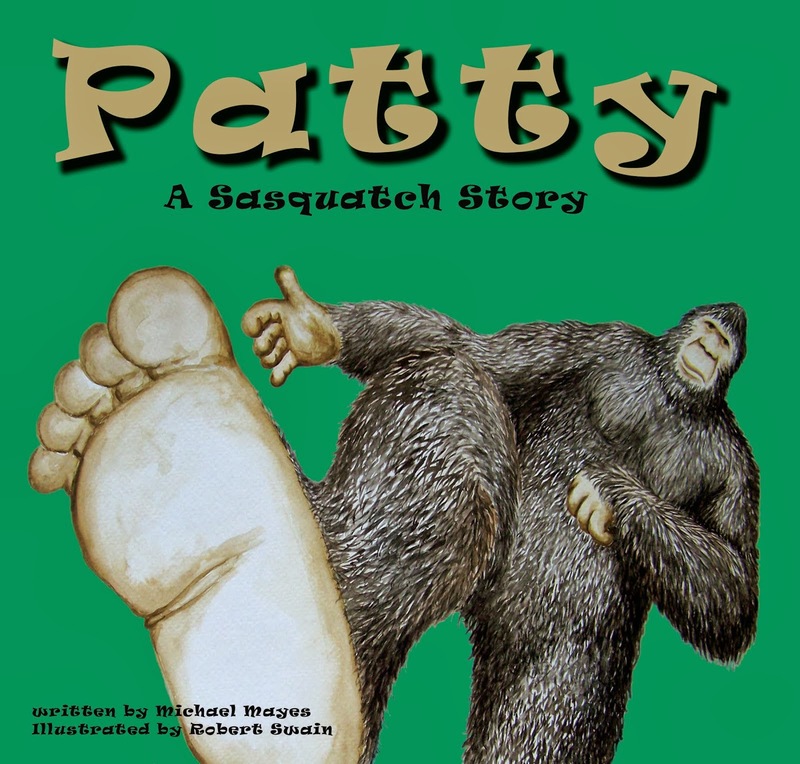 Another tale told around Nova Scotia campfires is of a Cape Breton sasquatch that seemed to take great pleasure in catching a larger fish - with its bare hands - than a stunned fisherman who had just landed one of his own. Still, the most likely explanation is that Jim Kaizer drifted off to sleep and had a nightmare, one that seemed incredibly real to him. It seems logical enough, but is it not possible that a lightly dozing Kaizer might have incorporated some real events into his dream? I know this has happened to me while in that gray area where I am half-awake and half-asleep. For example, a while back I was enjoying a Sunday afternoon nap on the couch. I had a dream that an old friend was ringing the doorbell. Suddenly, I snapped to and realized the doorbell was, indeed, ringing. It was not the old friend I had been dreaming of, but a young lady selling Girl Scout cookies (almost as good, lol). The point is, while dozing, my mind took something that was really happening – the ringing doorbell – and incorporated it into my dream. A good friend of mine shared a similar, though far creepier, story regarding this phenomenon and his mother-in-law. This lady is quite independent and makes a habit of backcountry hiking alone. She is sometimes gone a week or more on these solo hiking trips. Several years back she shared an experience with my friend she had while hiking in, if I recall correctly, Yosemite National Park. She always travels light and was carrying only her sleeping bag on this trip. One night, very late, she awoke to see a huge man with a thick beard leaning over her. My buddy asked her what happened next and she said she could not recall and must have just gone back to sleep. Is it possible, that a bearded man was traveling alone and on foot through the area in the middle of the night? I suppose, but I have often wondered if this woman awoke to see something else leaning over her and her half-awake mind turned whatever it was into a large, bearded man to make it more palatable and less frightening. Could Jim Kaizer have really have seen a red-eyed, hair-covered monster? Could his mind, traumatized by the recent tragedies and wracked by guilt, have dreamed the words of warning? In other words, could the creature have been real and the words spoken been the dream? Many have posited this is what happened to Crockett in the Piney Woods of Texas all those years ago. If so, what an incredible premonition. One can only wonder what his fate would have been had he heeded the warning and not proceeded to the Alamo. 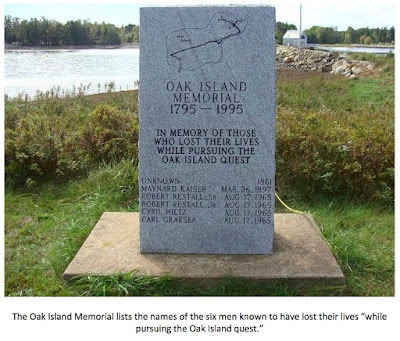 Jim Kaizer did heed the warning and never again set foot on Oak Island. Even so, his life ended tragically soon after. Perhaps, there really is no escaping our fate. Sullivan, Randall. 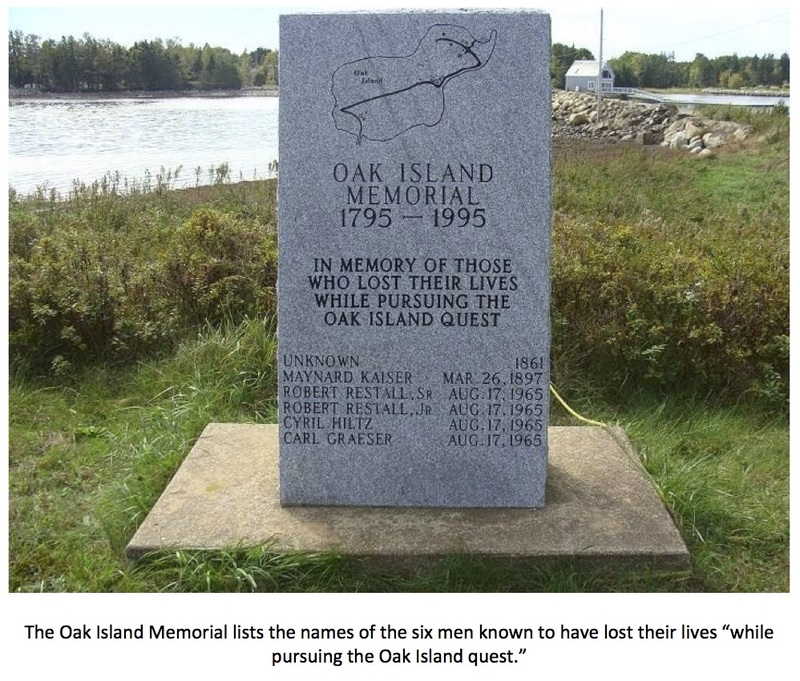 The Curse of Oak Island: The Story of the Worlds Longest Treasure Hunt. Atlantic Monthly Press, 2018. “Bigfoot Field Researchers Organization.” Bigfoot Field Researchers Organization, bfro.net/. Fairclough, Ian. 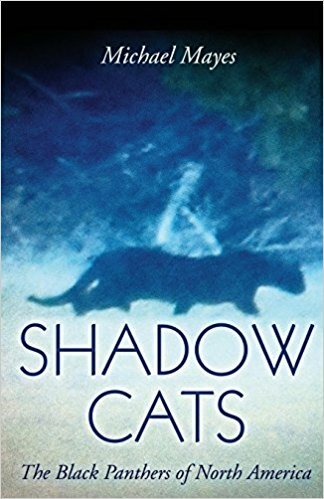 “Stories to Give You Chills and Thrills.” Halifax Chronicler Herald, 30 Oct. 2011.